I have been too busy making frozen summer treats to write. Some weeks ago we bought a peck of peaches from Roland’s farm up the way. There were 22 peaches in our peck, and I made a peach cobbler and two batches of peach ice cream. Margie sniffed. “Roland didn’t grow those tomatoes,” she said. I went straight home and told Ernesto this news, and he nodded as if he were not surprised. “He probably doesn’t grow the peaches, either,” he said, which seemed unfair because Roland has about five acres of peach trees. And in fact, later that afternoon we witnessed Roland crossing the road in his four-wheeler, hauling several half-bushels of peaches from the orchard to his house. So unless Roland is so devious that he places California peaches from Food Lion in his orchard then carts them around to make it appear as if he has picked them from his own trees, we can be sure that we had been eating fresh local peaches. I have to say, Roland doesn’t look one bit devious. There’s nothing devious about this ice cream recipe, either: It’s simple and delicious. I had forgotten how much I loved peach ice cream. Peel, pit, and slice 2 pounds of very ripe peaches (6-8 medium peaches). Stir thoroughly until the sugar has dissolved. In a separate bowl or large measuring cup, stir 1/3 cup of sugar into 3 cups of light cream. When the peach mixture and the cream mixture are both free of sugary grit, pour the cream into the peaches and mix thoroughly. Some people who are more patient than I am suggest that you must chill the mixture in the refrigerator until ready to proceed. I am always ready to proceed right away, and if you follow my instructions and stir thoroughly, you’ll be ready, too. Freeze the mixture in an ice cream maker. 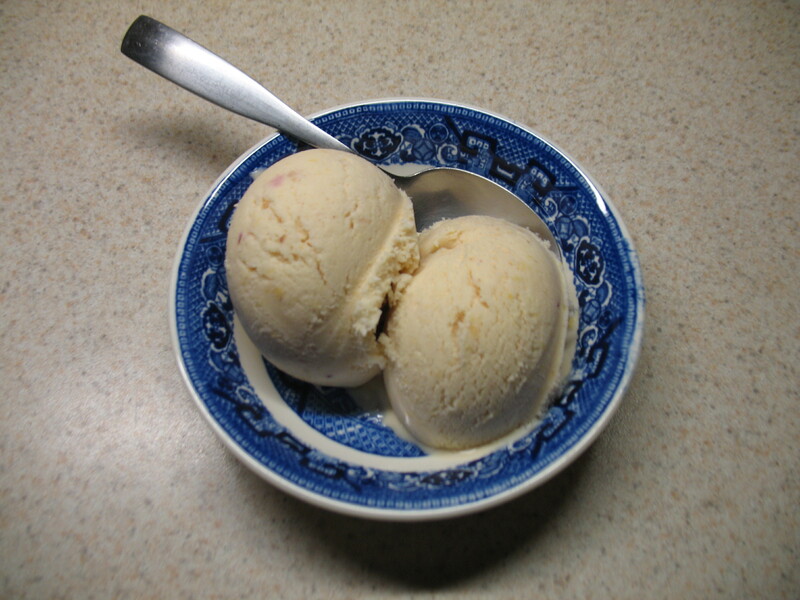 Once the ice cream is ready, spoon into a freezer-proof container (or two) and place in the freezer. Once the peaches were gone, we moved on to cantaloupes. Our garden produced about seven excellent cantaloupes this year, and I found a nice recipe for a sorbet which I am tampering with, adding various herbs from our patch. First, make a sugar syrup by mixing one cup of water and one cup of sugar in a small pot over medium high heat. Stir until the sugar is dissolved, then bring the mixture to a boil. Throw in a handful of mint or basil and allow the syrup to boil for 1 minute. Remove from heat, pour into a jar or bowl. Cover and chill. Yes, you heard me: This time you really do have to wait for the stuff to chill. When the syrup is chilled, strain out the herbs and pour the syrup over 4 cups of cubed cantaloupe. Add the juice of one small lemon. Place the cantaloupe mixture in a blender and purée until smooth. Freeze in an ice cream maker, then spoon into a freezer-proof container (or two) and place in the freezer. This is smooth and silky on the first day; later it will become icier and won’t scoop quite so prettily, but it will still be good. You don’t have to include any herbs if you prefer not to. Words–I often imagine this–are little houses, each with its cellar and garret. Common-sense lives on the ground floor, always ready to engage in “foreign commerce,” on the same level as the others, as the passers-by, who are never dreamers. To go upstairs in the word house is to withdraw, step by step; while to go down in the cellar is to dream, it is losing oneself in the distant corridors of an obscure etymology, looking for treasures that cannot be found in words. To mount and descend in the words themselves–this is a poet’s life. Photo credit: My niece, Anna Singleton. The Program in Agrarian Studies is pleased to announce the international conference entitled The Chicken: Its Biological, Social, Cultural, and Industrial History from Neolithic Middens to McNuggets. The three-day conference will bring together over 75 scholars, agronomists, public intellectuals, chicken growers, workers, industry representatives and activists from the labor, farm, animal welfare, environmental, and public health movements, whose work has helped to define and to change what we know about chickens and their production and consumption. o Over 15 diverse panels and plenary sessions! o Food, films and documentaries! o Advocacy information and book tables! Isn’t that a charming description? It’s presented with such enthusiasm and so many exclamation points that I know it was a great success. I was proud to see North Carolina well-represented at the Chicken Conference, with experts from East Carolina University and NC State University making presentations. I didn’t read far enough to know who was speaking on the subject of the chicken in myth and literature, but I do know that Chanticleer and the Little Red Hen were on the agenda. And isn’t the idea of concurrent chicken-related exhibits interesting? That’s what inspired me to collect some exhibits of my own, because I have a fairly long history with chickens, myself. In fact, I made my acting debut in first grade as the Little Red Hen, wearing a full-head mask made from a large brown-paper grocery sack. That was my earliest experience with chickens in literature, and it is nice that the Little Red Hen held the moral high ground in that story, because in general chickens don’t. A year earlier, as I helped my grandmother gather eggs from her little coop, I had tried to imitate her confidence and reach beneath a hen to extract her eggs. But before I could get my hand in position, the gimlet-eyed chicken in the nesting box coolly leaned forward and pecked me—hard!—on the upper lip. I wasn’t permanently scarred by that experience, and when I was about 20 years old I got a summer job in a commercial hen house, collecting eggs for pay. I was better prepared this time around, with a tobacco stick that I could use to knock the roosters down if they became too confrontational, and an athletic sock with the toes cut out to wear on my arm for protection against henpecks. I went up one side, and then down the other of the long, low metal building, placing the eggs in large plastic flats that stacked on a sort of trolley that hung from an overhead track and could be pushed along as I went. It was a wonderful job. One morning I found a passel of newborn kittens in a nest. Then the weather got really hot, and the Grim Reaper reaped him a bunch of hens and not long after that the egg season was over. Those commercial hens were large and white, and they pecked my athletic sock with a vicious little twist of their beaks when I reached under them to get their eggs. 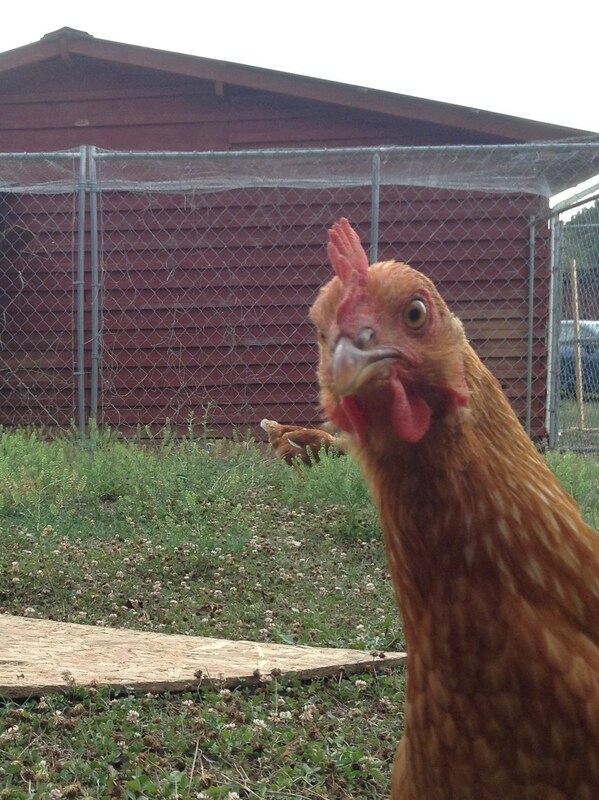 Our hens (as in the photo above) are approximately the color and size of footballs. They aren’t aggressive or angry, but they do sometimes raise their wings and hunker down, as if they are about to do something drastic and painful. It appears to be only a pose. At the moment my chickens can do no wrong, because they have begun to lay eggs! 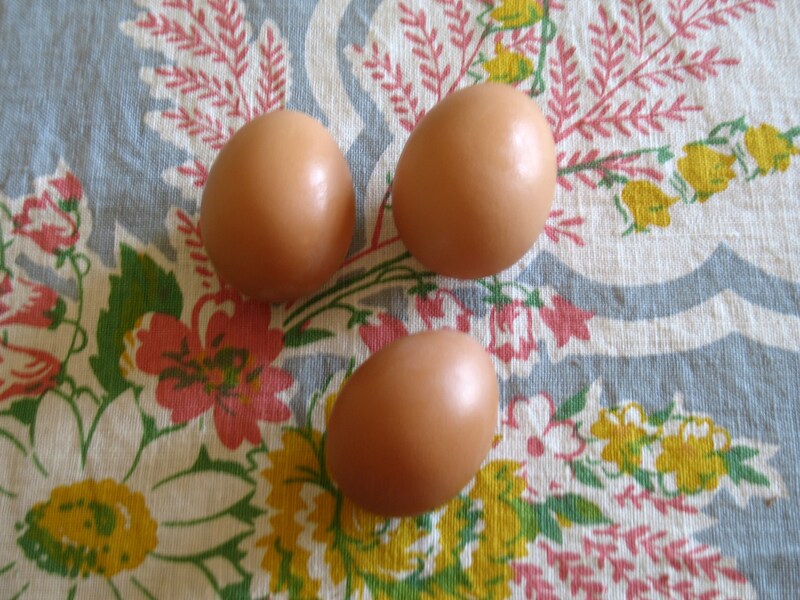 The eggs are mostly small, although a few have been full-sized (and usually double-yolked). Because of this bounty, I am in a mood to salute the chicken—in literature and on the nest—with some odds and ends I scratched together. 2. M.F.K. Fisher once said: “Probably one of the most private things in the world is an egg before it is broken.” If you want to risk invading the privacy of an egg in a violent way, there is a trick that you can try. Place an egg in your hand and, holding your arm out straight, squeeze as hard as you possibly can. The physics of it is that as long as you keep your arm perfectly straight, you can squeeze until you’re red in the face and the egg won’t break. But if your elbow bends, even the slightest bit, the egg will explode and a great deal of egg yolk will go all over everything, including in places where you won’t find it for years. So if you want to try that particular trick my advice is to go outside and do it several yards away from the house. I vote for literature, since at the moment I am happy with my chickens. …I feel as if I should never move again. I have run faster and farther than I have done since I was at school. You have no conception of the difficulty of rounding up fowls and getting them safely to bed. Having no proper place to put them, we were obliged to stow some of them inside soap boxes and the rest in the basement. It has only just occurred to me that they ought to have had perches to roost on. It didn’t strike me before. I shall not mention it to Ukridge, or that indomitable man will start making some, and drag me into it, too. After all, a hen can rough it for one night, and if I did a stroke more work I should collapse. My idea was to do the thing on the slow but sure principle. That is to say, take each bird singly and carry it to bed. It would have taken some time, but there would have been no confusion. But you can imagine that that sort of thing would not appeal to Ukridge. There is a touch of the Napoleon about him. He likes his maneuvers to be daring and on a large scale. He said: ‘Open the yard gate and let the fowls come out into the open, then sail in and drive them in a mass through the back door into the basement.’ It was a great idea, but there was one fatal flaw in it. It didn’t allow for the hens scattering. We opened the gate, and out they all came like an audience coming out of a theater. Then we closed in on them to bring off the big drive. For about three seconds it looked as if we might do it. Then Bob, the hired man’s dog, an animal who likes to be in whatever’s going on, rushed out of the house into the middle of them, barking. There was a perfect stampede, and Heaven only knows where some of those fowls are now. There was one in particular, a large yellow bird, which, I should imagine, is nearing London by this time. The last I saw of it, it was navigating at the rate of knots, so to speak, in that direction, with Bob after it barking his hardest. Presently Bob came back, panting, having evidently given up the job. We, in the meantime, were chasing the rest of the birds all over the garden. The thing had now resolved itself into the course of action I had suggested originally, except that instead of collecting them quietly and at our leisure, we had to run miles for each one we captured. After a time we introduced some sort of system into it. Mrs. Ukridge (fancy him married; did you know?) stood at the door. We chased the hens and brought them in. Then as we put each through into the basement, she shut the door on it. We also arranged Ukridge’s soap-box coops in a row, and when we caught a fowl we put it into the coop and stuck a board in front of it. By these strenuous means we gathered in about two thirds of the lot. The rest are all over England. A few may be in Dorsetshire, but I should not like to bet on it. So you see things are being managed on the up-to-date chicken farm on good, sound, Ukridge principles. This is only the beginning. I look with confidence for further exciting events. I believe, if Ukridge kept white mice, he would manage to knock some feverish excitement out of it. He is at present lying on the sofa, smoking one of his infernal brand of cigars. From the basement I can hear faintly the murmur of innumerable fowls. We are a happy family; we are, we are, we ARE! P. S. Have you ever caught a fowl and carried it to roost? You take it under the wings, and the feel of it sets one’s teeth on edge. It is a grisly experience. All the time you are carrying it, it makes faint protesting noises and struggles feebly to escape. P. P. S. You know the opinion of Pythagoras respecting fowls. That ‘the soul of our granddam might haply inhabit a bird.’ I hope that yellow hen which Bob chased into the purple night is not the grandmamma of any friend of mine. Note: I am deeply indebted to Chickens in Literature, my source for the Wodehouse excerpt and the Flannery O’Connor quote. The site also has amazing chicken illustrations. Go look for yourself, and enjoy a truly fabulous chicken-related exhibit. In the meantime, here’s a peaceful picture of our very first eggs. Don’t they seem to glow?